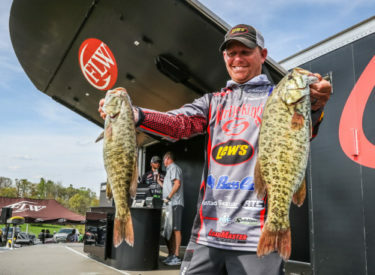 JEFFERSON CITY, Tenn. — Pro Andrew Upshaw of Tulsa, Oklahoma, caught a five-bass limit weighing 18 pounds, 6 ounces to lead the field after day one of the FLW Tour at the Cherokee Lake presented by Lowrance. Right behind Upshaw in second place is pro Dylan Hays of El Dorado, Arkansas, with 17-13 and Tim Frederick of Leesburg, Florida, in third with 17-4. The full field of 164 professionals, who are casting for a top award of up to $125,000, will continue competition into day two, with just the top 30 fishing Saturday and the final 10 competing Sunday.